Soul Purpose Ministries hasn't added a story. Valentine's Day is, above all, a celebration of love! Let's reclaim it by giving our best for the furtherance of the gospel. "The greatest love you can show is to give your life for your friends." (John 15:13) Your gift will help us reach more people with the gospel; making more friends for eternity! 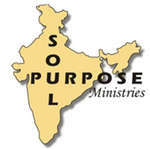 Soul Purpose Ministries hasn't posted any updates yet. Soul Purpose Ministries is managing the funds for this campaign.